Spend another £27.88 to get FREE DELIVERY! LV100HTA 100mm 4 inch safety extra low voltage extract fan with SELV transformer, integral humidistat and over-run timer for use in wet areas. Auto on/off operation via the humidity sensor adjustable for 50-90% relative humidity. Timer adjustable from 2 to 20 minutes. Is supplied with a universal fixing fit containing wall tube, 2 x gasket, outer grille and skirt moulding for window and wall installations. 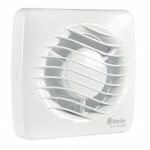 LV100 fans are 12V Safety Extra Low Voltage (SELV) 100mm (4") axial extractor fans, offering complete peace of mind. 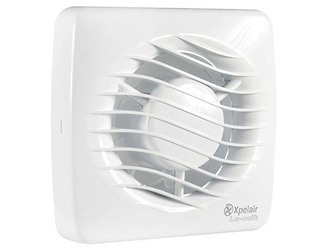 These fans are specifically designed to be installed directly over the splash area zone 1 in complete safety, with the SELV transformer sited out of reach of any person using the bath or shower. All models come complete with a universal mounting kit and are suitable for wall, ceiling or window mounting (in single glazing up to 6mm) applications. The kit includes an air operated backdraught shutter and all models are supplied with a 12V SELV transformer. Control options include integral Pullcord and timer. Humidistat and PIR options offer automatic control. The LV100 range conforms to UK Building Regulations mechanical ventilation for toilets and bathrooms.